Impatience Is Pride? – 13 Points That Say It Is! 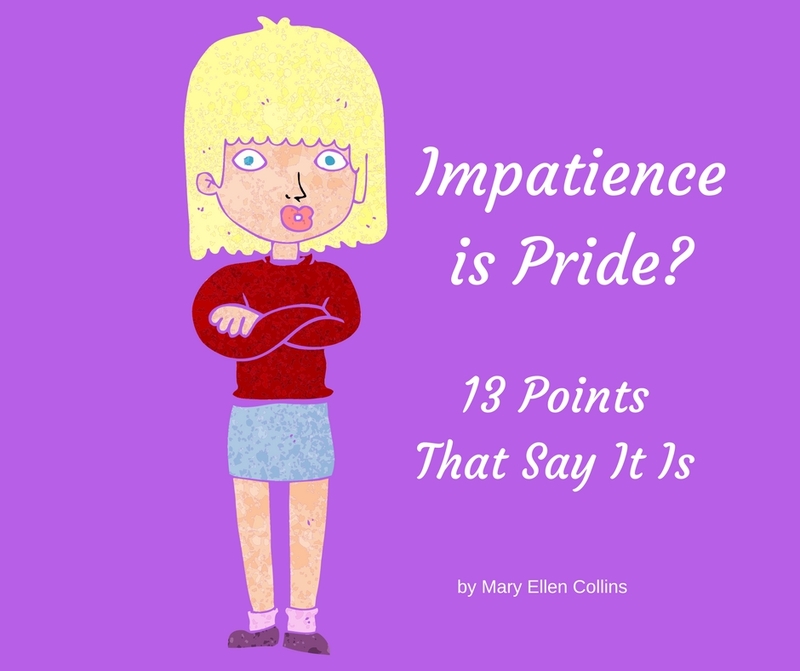 I recently heard an expert on biblical truths say that impatience is pride. What? No, I don’t believe that. Really? I know that God hates pride. But I have never heard that impatience is pride. How can that be? Think about it, what happens when you get impatient? That’s an easy one to answer for me. When I get impatient it stresses me out. I ruminate. I get emotional. I cuss. Yes, you heard me right. I am an old Emergency Room nurse. Learning to cuss was a necessary survival skill. I can get really ugly. But the worst of it, it eats me up inside. But pride? Where does that come in? I just don’t want to believe it, not me. I pray and ask God to open my eyes. Help me look into me Lord. But then I am caught short. Hmmn . . . When do I get impatient? Oh my, let me count the ways. When I want someone to follow through with what they either said or agreed upon and they don’t. This is in fact one of my emotional triggers which sends me right over the edge. But how can that impatience be pride? Is it because I think my way of doing things is the only way? Oh, now I see. It is kind of like a double whammy. Not only am I not being loving to my brothers or sisters, it sets me up for spiritual attack. The negative self-talk begins by criticizing and then I move into how it should be done. Oops. I am so guilty. Nope not me! I am secure in my identity in Christ. I am a child of God. 2. The need to be right. I may be somewhat guilty, so I will give myself a 5. Bummer, I have been caught. I want to think I negotiate. Hmmm? Maybe a 4? 4. More invested in being heard than in hearing. Nope not me, I pride myself on being a good listener. Did I just say pride? I really am a good listener. A 10! Is there a difference between being angry and temporarily upset? I do not hold onto anger but I do get angry at times. I do not justify or blame. Can I get a 6? BINGO! I have been had. 7. Lack of submissive attitude. Oh, do I ever need to reread this? It is trusting God, not me. 9. Receiving correction but not changing. “Saying thank you for the feedback, but never change. This too is a form of pride. Insecurity and fear prevents him true change”. I cherish and always take to heart feedback. I do change. I am a work in progress! 10. Needing others to take your advice. 11. Needing to proclaim your title or degrees. Nope, not guilty. Not me! Webster’s dictionary defines stubbornness as “unduly determined to exert one’s own will, not easily persuaded and difficult to handle or work, resistant.” The root issue of stubbornness is willfulness, which is ‘I want what I want when I want it.’ Another name for pride. Oops, I was doing pretty good until now. I am really not interested in comparing or competing with others. I have so much work to do on me, I don’t have time! Give me a gold star on this one! Whew! Made it through. This was grueling to see myself dissected like this. How did you do? Which ones challenge you? Patience takes practice. Unfortunately, it sometimes takes making it through times of trials. We have to come to a place where we understand that there are so many things that are not under our control. We have to let go of our pride and our thinking that we can make things happen in our lives. God is in control. If we give our requests to God, He will listen, but He will choose what is best for us, and He has perfect timing. I leave you to examine your own impatience. Pray for me and if you need prayer for your impatience, just ask, I will pray for you too.